Coney Island is a movies of firsts and lasts. It's a "first" (for me) because it comes in at the top. It's my favorite of the Keaton-Arbuckle collaborations. But I realized upon watching it today -- for the dozenth time or so -- that there's quite a few other firsts and lasts in the film. I thought about this as I watched Buster Keaton appear in the opening scene. I admit he did that last film too (Oh Doctor), but Coney Island gives us a special new first in that not only does Keaton show up in the first scene, but he is the first of the Comique troop to appear. In other words, for the first time ever, he is onscreen even before Fatty Arbuckle. Coney Island is a "last," because its the last film the company made in New York, before moving to the west coast to shoot pictures. And another sweet first, is that this may be Keaton's first screen kiss. I'd have to look back at the other releases to confirm it, but I feel pretty sure. (I know there was a bit of flirting with the housemaid in The Cook; but I don't think there was any kissin'). Way to go Buster. He's growing up fast, haha. Remember that the last film release had Buster playing a child! I'm not sure I can call this next observation a certain "last," but I do think we're near the end of the line for movies where Keaton does a lot of smiling. And crying. And bigger, broader emoting. Here, in Coney Island, for the bulk of the picture, Keaton has settled in around the stone face style that will be his signature moving forward. But he does have a few scenes where we get to enjoy that gorgeous mug, well, mugging it up. This film also has an interesting end-of-an-era feel with respect to the "Keystone Cops." In Coney Island, they are present throughout -- bumbling and jumping and running. According to my research (i.e. the quick check on Wikipedia that I just did), the Keystone Cops were a thing between 1912 and 1917 - placing this 1917 film at the end of their prominence in cinema. 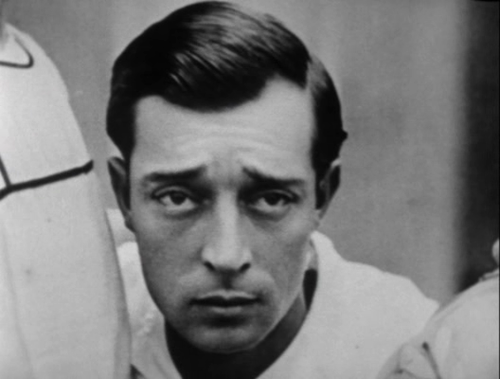 And, on a bittersweet note, it is also the last film I'll be watching in my Buster Keaton Centennial Celebration of 1917 film releases. Yes, there is one last film released in 1917 which will need to be discussed (December 10th's A Country Hero), but it is considered a lost film. SO ... I'll review it :) but I won't be able to watch it, haha. Beyond the firsts and lasts that are stacking up rapidly, what this film also has going for it is that -- for the first time -- it feels as though the action of a Comique film really fits its artistic vision as a package. What's interesting is that Coney Island does this despite being in most respects much like Arbuckle's prior films: it is uncomplicated, lighthearted, chaotic fun. 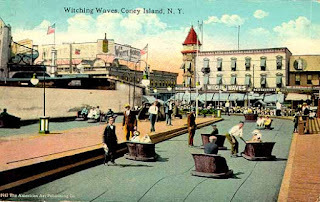 But while the prior films felt rather senseless, Coney Island feels integrated. Its a better version of the genre. The chaotic fun seems to mean something. It fits. And there's a reason for that: they're at a theme park. And the theme park is a world of chaotic fun. This is well suited thematically and as a result, just, somehow works. In fact, the appearance of the theme park in this film is simply astonishing! Being able to see so many scenes filmed 100 years ago at the real Coney Island park is incredible. I love it as much as I love anything else this movie. Even though I've never been to Coney Island, nor do I have any particular love for the park or the region, it can hardly be denied that Coney Island is itself a star of this film. And it was probably an important part of the appeal for contemporary audiences; but it has to be so much more special today for the slice of history the modern viewer is able to enjoy. Watching it now... looking at the kinds of rides, foods, attractions, and activities our ancestors enjoyed, it strikes me how very similar these people were to us. And yet, how very different the standards of safety were. Imagine the craziness of "The Witching Waves," which seems a horrendous pinching and snagging hazard, not to mention seeing folks fly down a water ride incline in an open boat without being secured (and of course tumbling out!) And what about the incredible investment in power it must have taken a century ago to light up that park the way we see it in the opening shot...? Just wow. The opening shots of Luna Park are so beautiful and so evocative. There is a feeling of telling a visually beautiful story that goes beyond the typical Arbuckle fare. And that brings me to another thing that is special and a "first" for me in a Comique film. This is the first time where setting, place, cinematography felt important and lovely. I'm not going to recount the plot of this film in depth, because I'm not sure it's necessary. As I said, unlike the last release -- Oh Doctor -- Coney Island has definitely gone back to being a rather simple, silly picture unencumbered by many story elements. So here it is, in brief: ... Ketaon and his girlfriend are watching a parade, but when they want to go into Coney Island, they can't because Buster has no money. Al St John walks by and escorts the young lady into the park leaving Keaton to sneak in in a barrel. Once inside they encounter Fatty Arbuckle who is there with (and trying to escape from) his wife. Machinations happen and next thing you know Fatty walks off with the lovely lady while St John is arrested. 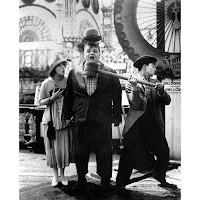 Each of the three main stars go around doing silly things - hitting each other with mallets and doing backflips and Keystone kicks and being tossed from amusement rides and changing in dressing rooms -- Fatty using this as a nice excuse to get in drag again. Ultimately Fatty's wife runs into St John and the players all converge again for a big reveal - Fatty is not a woman! And, as mentioned, buster ends up with the girl. As far as the action goes, it seems par for the course, and all blurs a bit together. And even blurs outside its own lines a bit. For instance, though I've seen the film many times, I found myself waiting for the scene where Keaton goes through the Tunnel of Love, before realizing that that scene is in a different film! (The Balloonatic). 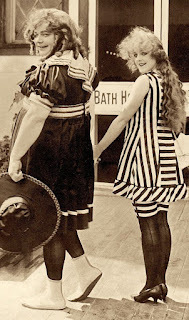 Similarly, I found myself confounding certain bathhouse scenes from The Cameraman involving a rotund woman's bathing suit with those in this picture; and I had a flash-forward moment recalling how Keaton quite similarly emerges in a swimsuit in short film Hard Luck. So though, at the edges, the film may not be perfectly compact, nor does it enjoy a total sense of clarity, its chain of gags, vignettes, and silliness really works for a variety of reasons. First up: because they are particularly good gags and vignettes! There is a nice amount of balance, with lots of characters (including the Cops and the Park) getting to shine a little bit. Plus, we get to see BK in a bathing suit -- and come to think of its that's probably another first. ... a very good one. Another reason it all works, as I mentioned above, is that the backdrop of the chaotic theme park gives the right setting and context to make the mindless fun seem like exactly what we want. Finally, I was thinking today about why I am forgiving with Coney's Island's lack of plot, whereas in other Comique films, I felt the absence of plot and structure as a bit of an issue. I realize that it doesn't matter here because here there is very little attempt to give the film any plot at all! This film is just really about a day at Coney Island. Its kind of like a Seinfeld episode. Its doesn't matter what the point of the episode it; the fun is in simply being there with them. Whereas in the other films, there is ostensibly a plot, some attempt to move a story along - a love triangle, some intrigue, or complication, and some attempt at resolution made. Here, there is a feeling of pointlessness. Like the scene at the end when Fatty and Al come out of jail declaring all their troubles to be due to women and vowing to avoid them... until a couple of cuties walk by and the boys are off. There's no moral, plot, theme, happy ending or anything to take away. Just a day of fun at the beach. Yes, a very fun day at the park. It is very cool to have Coney Island of 1917 preserved on film! Think how much fun they must have had filming this there. Just for the record-- Buster is one of the Cops, rumor has it that is him in drag flying out of the boat ride, and he does quickly kiss the maid in Rough House. Love Fatty's scene in the women's dressing room (nice document of ladies' fashions too) and BK's back flip! Maybe A Country Hero will be suddenly discovered for us to view-- we can always hope! P.S. Forgot to mention seeing that vintage postcard is very cool. Thanks as always for checking in on Buster Keaton Day! 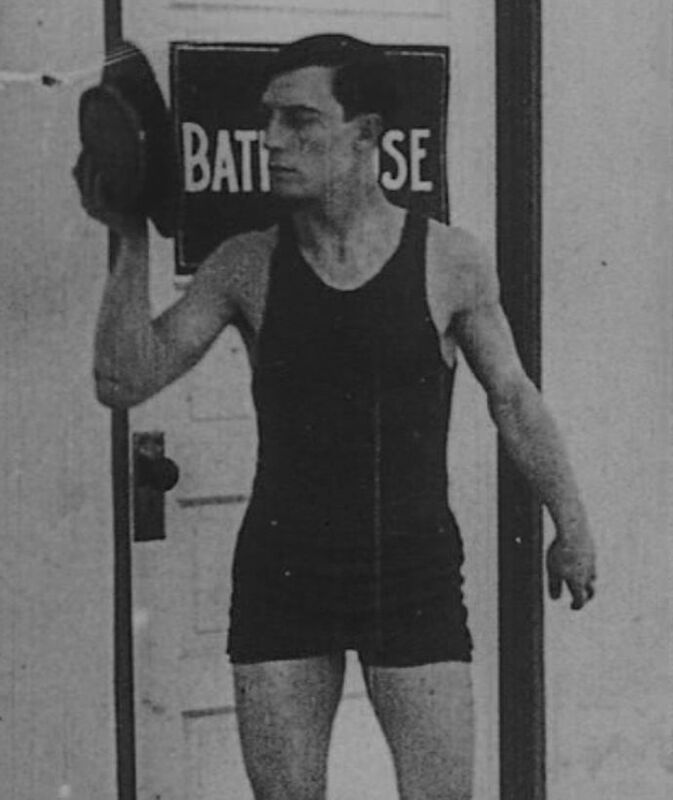 (shouldn't every day be Buster Keaton Day?) I've been wanting to find time to look for that maid scene in Rough House. Hard to believe I'd miss a kiss! Yep. I'd heard that about Keaton taking the tumble out of the boat. It pretty much had to happen :) Not surprised he was a Cop as well. Love the way old movies came together!